It's no secret you can secure controlled substances, fire extinguishers, and other vital items with tamper and security seals from Safety Emporium. A trade secret is any formula, pattern, device or compilation of information which is used in one's business, and which gives him an opportunity to obtain an advantage over competitors who do not know or use it. It may be a formula for a chemical compound, a process of manufacturing, treating or preserving materials, a pattern for a machine or other device, or even a list of customers. In other words, the trade secret is proprietary information, that which the holder of the secret does not wish to be known to others, particularly his competitors. In the context of an SDS, a trade secret and "secrecy" have a very rigorous definition as defined by OSHA in Paragraph I of the Hazard Communication Standard, 29 CFR 1910.1200. The claim that the information withheld is a "trade secret" can be supported. (key point; more below). The information contained in the safety data sheet concerning the properties and effects of the hazardous chemical is disclosed. The specific chemical identity and percentage is made available to health professionals, employees, and designated representatives in accordance with the applicable provisions of Paragraph (i). The designation of an incident as a "medical emergency" is left to the discretion of the treating physician or nurse. Failure to disclose the identity in this situation will result in the issuance of a willful citation. For non-emergencies, where OSHA believes that the chemical manufacturer, importer or employer will not be able to support the trade secret claim, the withholding of a specific chemical identity shall be cited as a violation. Appendix E of 29 CFR 1910.1200 has a very specific and rigorous definition/discussion of "trade secret" which states "Matters of public knowledge or of general knowledge in an industry cannot be appropriated by one as his secret. Matters which are completely disclosed by the goods which one markets cannot be his secret." So if you have a product which is easily reverse engineered or is a generic equivalent of other products, it would be quite difficult to support such a claim. You can not claim a "trade secret" merely for your own convenience or to prevent others from knowing that your magic cleaner is really just isopropyl alcohol. See this OSHA interpretation letter titled "0/23/2001 - Criteria for trade secret status" for more information. Trade secret exclusions in SDS's are not very common. While we do not have any recent data, we know that at one point the DoD's non-public HMIRS system contained about 270,000 MSDS's and only about 5% of these had proprietary information in them. 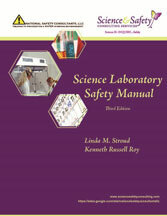 This guide to safer laboratories is just one of many safety reference books at Safety Emporium. On occasion, you may encounter an SDS that does not list the hazardous components by chemical name. If the trade secret provision of Paragraph (i) is invoked, the SDS must specifically state that the identity is being withheld as a trade secret and information about the properties and effects of the hazardous chemical must still be disclosed. In addition, the specific chemical identity must made available to health professionals, employees, and designated representatives in both emergency and non-emergency situations as detailed in Paragraph i(3). Moreover, individual state Right-To-Know (RTK) laws may afford employees additional access to trade secret information. The trade secret provision may not be invoked merely to prevent recipients from seeing the identity of the supplier or distributor of the product. See our SDS FAQ question As a distributor, can we change the name and address on an SDS?. In the state of New Jersey, a trade secret claim must include the New Jersey Trade Secret Registry Number (TSRN). WHMIS 2015 - Confidential Business Information (CBI) including trade secrets under Canada's WHMIS system. The Metzger Law Group discusses Can a Toxic Chemical Be a Trade Secret? where a trade secret is claimed. A comprehensive article about trade secrets at Wikipedia. Trade Secret Model Based on OSHA Process Safety Management Requirement from the open access journal Procedia Engineering 2016, 148, 1089-1095. Entry last updated: Friday, February 23, 2018. This page is copyright 2000-2019 by ILPI. Unauthorized duplication or posting on other web sites is expressly prohibited. Send suggestions, comments, and new entry desires (include the URL if applicable) to us by email.